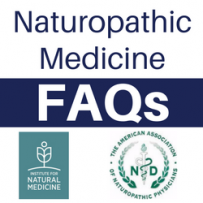 The AANP and the INM would like to acknowledge Leonard A. Wisneski, MD, FACP and Dave Johnson, MD, FACC for their contributions to the content of this FAQ. NDs take a whole-body approach to health. There are many factors that affect your health. Naturopathic doctors take the time to explore as many of these factors as possible, including diet, lifestyle, family genetics, psycho-emotional, spiritual, socioeconomic, and environmental issues, and more. They typically spend one hour or more with patients in an initial exam to uncover the underlying causes of health concerns. NDs prioritize natural therapies. Naturopathic doctors utilize minimally invasive treatments whenever possible. Clinical nutrition, behavioral and lifestyle medicine, and botanical medicine are just a few of the many therapies NDs apply to support the body’s health restoring processes, as opposed to just reducing symptoms. While NDs are trained in medical school to use prescription drugs, they emphasize less toxic substances that promote natural healing first. If their state license permits, NDs can prescribe medications when necessary. If not, they will refer patients to, and collaborate with, an MD colleague. NDs have rigorous training in clinical nutrition. Naturopathic doctors recognize nutrition as a cornerstone of health. During medical school, ND students complete an average of 155 classroom hours of nutrition education. They provide individualized nutrition assessment and guidance utilizing evidence based recommendations. Their deep experience spans areas including macronutrients, micronutrients, dietary assessments, diet types, diet and nutrient therapy, supplement-drug interaction, nutrition technology, and more. NDs have advanced training in behavioral medicine. NDs recognize that lifestyle and environment play a pivotal role in your health. A large percentage of chronic conditions are potentially preventable by modifiable lifestyle changes. Having completed more than 100 hours of behavioral medicine coursework in medical school, NDs are trained to uncover the social, cultural, cognitive, environmental, and emotional issues that influence your overall health. They empower patients to make and sustain changes for optimal health and wellbeing. NDs provide highly individualized care. NDs understand there is no one-size-fits-all treatment. Utilizing a patient-centered approach, NDs take the time to understand your health goals and to explore the genetic, environmental, and behavioral/lifestyle factors that may be roadblocks to optimal health. Naturopathic doctors create treatment plans uniquely tailored to your health status, goals, and lifestyle. NDs are fluent in integrative and complementary approaches. Because of their diverse training in complementary therapeutic modalities, NDs know when and how to utilize integrative approaches in a patient’s overall treatment. Incorporating treatments such as acupuncture, mind-body medicine, chiropractic and other integrative disciplines, NDs will refer to other expert practitioners as needed/if appropriate. More people are looking for complementary, integrative and whole-body approaches to health care. Wellness, prevention, and health creation beyond disease management are just a few of the reasons why. In response, bi-partisan policymakers are joining forces to advocate a whole-person, integrative model of healthcare. And numerous national physician groups are now recognizing the value of complementary approaches, putting forth new treatment guidelines for centuries-old problems, such as chronic pain. Naturopathic medicine, which emphasizes prevention, self-healing, and natural therapies, offers patients a compelling whole-body health care choice. Today there are approximately 6,000 licensed naturopathic doctors practicing in the U.S. Twenty-three U.S. states and territories currently license NDs. Educated and trained in four-year, post-graduate, accredited naturopathic medical colleges, NDs diagnose, prevent and treat acute and chronic illness. They restore and help establish optimal health. Trained as primary care doctors, NDs can play a central role in reversing the current U.S. chronic disease epidemic. Increasingly, they are working in collaboration with conventional medical doctors, and are recognized as a vital part of a patient’s health care team. A growing number of prominent health systems, hospitals, and cancer treatment centers now have one or more licensed naturopathic doctors on clinical staff at their facilities. Medical doctors who champion naturopathic doctors recognize that NDs can help deliver better health outcomes at lower costs. They refer out to and collaborate with NDs both in primary care and in specialized areas including cancer treatment, chronic pain, gastrointestinal disease, diabetes, heart disease and more. ← How Do Naturopathic Doctors Help Address Men’s Health?